Quality: Good transfer to dvd, starts with some minor flicker but there is no better version of this classic available on other sites. Neither All Creatures Great and Small nor this amiable sequel were as successful as James Herriott's original memoirs or the long-running BBC television series. Yet this Yorkshire comedy (which was released in the States as All Things Bright and Beautiful) is, nevertheless, a pleasingly unpretentious entertainment that can be enjoyed by the whole family. 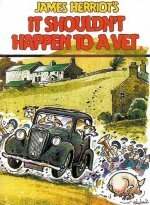 The formula of pre-war country cosiness, bawdy humour, folksy characterisation and animal emergency is meticulously repeated as John Alderton capably steps into the wellies vacated by Simon Ward, while Colin Blakely hammily takes over from Anthony Hopkins, leaving Lisa Harrow alone to return from the first venture.